TWITTER…wisdom…from the bluebird on Twitter to the Courts of Heaven…better get praying! “Curse not the king, no not in thy thought; and curse not the rich in thy bedchamber: for a bird of the air shall carry the voice, and that which hath wings shall tell the matter.” (Ecclesiastes 10:20 KJV). No matter if it is a “tweet” on Twitter or the Holy Spirit reveals something to us as one of His servants, the bible makes it clear that the Holy Spirit reveals all hidden truth and shows us things to come. (see John 16:13…take time to read John chapters 14-16). If there ever was a time we need to pray as a nation, it is now. Instead of attacking and maligning, we must be praying as God tells us in His Word. Why would anyone in their right mind try to destroy someone? They are deceived by the enemy. There is a destructive element in griping and complaining all the time about the government, or anything else for that matter. While we do need the facts, we learn to operate in truth. Truth is God’s Word and His ways. Truth is doing the right thing at all times. Truth is being the same person in private as in public. Truth takes a stand with God. A heart problem will eventually show up if it is not fixed, repaired, or replaced. A heart problem eventually shows up in actions as well. The Bible tells us that whatever is in the heart will come out of the mouth. Listen to your words and check yourself. Don’t check your neighbor. Check your own heart. We each have to stand before God as individuals. Jesus taught us by His own example. He showed what true leadership is….action not a position. Jesus, the Son of God, taught us that we lead by serving. When Jesus wrapped the towel around him and began to wash the feet of his own disciples, he was teaching a principle for all time. Even though we are clean on the inside as born-again believers, we must daily cleanse our walk through spending time in God’s presence where we are empowered to live a spirit-filled life in a world of hurting people. Where we are not so distracted by technology that we can hear God at the slightest whisper at the door of our hearts. Where we are empowered to live with eternity in mind at all times. Check your own heart….always stay humble and kind. We must constantly focus on loving and leading as Jesus Christ does….and renew our minds so our words line up with God’s Word. When we remember that how we treat people is how we are treating Jesus Christ, we have a wakeup call. Pray for the President of the United States, President Donald J. Trump and all those in authority. We are called to pray for leaders across the land. If you live in another nation and are reading this, pray for your leaders. Pray for each other. Stand in the gap through prayer. Be kind. The secret to love is kindness. 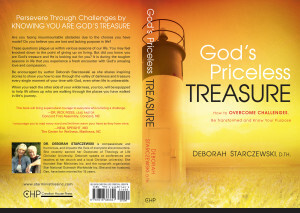 GOD’S PRICELESS TREASURE (How To Overcome Challenges, Be Transformed And Know Your Purpose)…. learn to move from drama to destiny, pain to purpose, trials and tragedy to triumphant living. A LEAP OF FAITH (25 Days At The Mercy Seat)….the full account of God raising my husband from death, healing him from two open-heart surgeries, two open-heart surgeries, and the walk at Mercy for 25 days. This book will keep you turning the pages…. THE MIDNIGHT HOUR (Will America Turn Back To God? )… a must read for every leader and family. Books available on Amazon, Barnes & Noble, www.starministriesinc.com and other distributors.